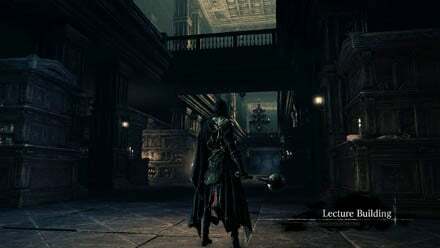 Lecture Building 2nd Floor is a location in Bloodborne. Patches the Spider - Actually resides on the Ground Floor, but is available for a new conversation from 2nd floor via a ladder. This location is connected to Lecture Building 1st Floor by a ladder. This location can be reached after defeating the One Reborn. Online co-op is not allowed within this zone. It can be used as farming location the first time you access the first floor (get the tonsil stone in the forbidden woods and then let the Amygdala catch you). There is a room with many Slime Student enemies which are fairly easy to kill and located really close to the lamp, giving you around 15,000 echoes per run. Use a Bolt or Fire weapon if you can, as these enemies are stronger against physical and arcane damage. Thrust attacks may also be advantageous to the lower level character. Use combo or strong attacks for maximum echoes, and of course runes if you have any. Finally, using a Bold Hunter's Mark (bought relatively cheap from the Hunter's Dream) to respawn the enemies, and taking advantage of the short loading time for this area, there's a minimum of 45 seconds per run, making this method extremely useful. Having decent item discovery can allow you to use your flamethrower virtually non-stop due to the high drop rate of quicksilver bullets. Since the students deal massive durability damage, using this strategy will help avoid needless trips to the Hunter's Dream. Very nice place to farm Quicksilver Bullets as well. 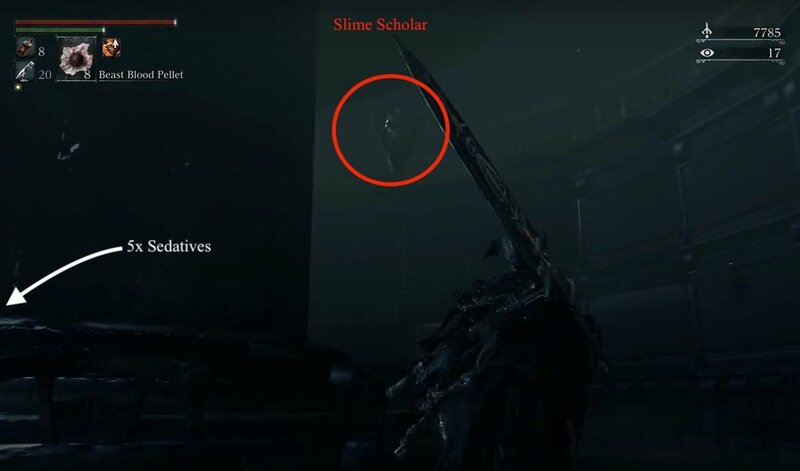 There are two variations of the Slime Scholar. The ones with graduation caps are melee enemies. The ones without graduation caps use ranged water attacks. 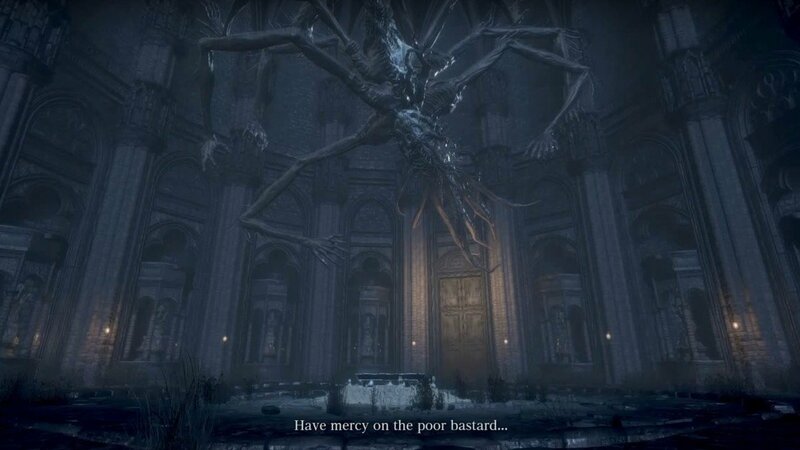 To reach this location, let the Lesser Amygdala in the church to the right of the Grand Cathedral, kill you while having the Tonsil Stone in your inventory. 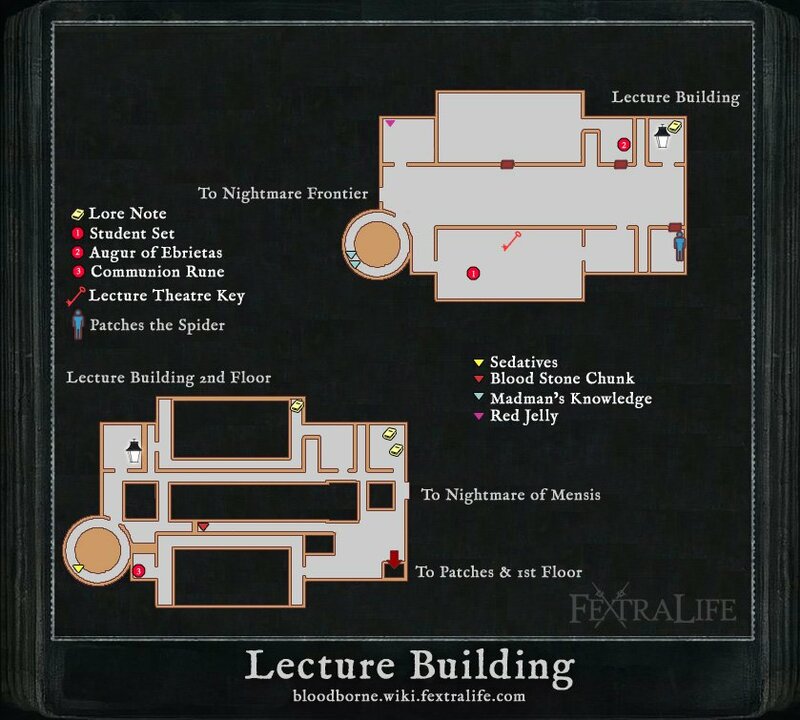 It'll trigger a cinematic, for you to then spawn next to the lamp on the first floor of the Lecture Building. 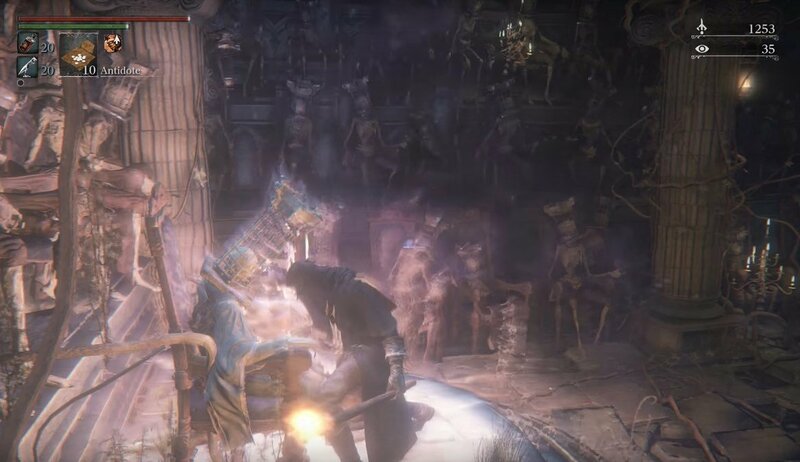 Alternatively you can get to the Lecture Room 2nd floor by beating the One Reborn, and just past him through Advent Plaza, there is a mummy that you can inspect that teleports you to the 2nd floor lamp of the Lecture Building. Much like the first floor, you'll start in a dimly-lit room with only a lantern to light.Straight across from the door you just opened is another set of doors. Open these doors and head around the curved room to pick up 5x Sedative from a corpse. When you head back to the door a Slime Scholar will drop from the ceiling above the floor. Kill it and head out into the hall. Heading out the room containing the lantern, turn left and take the first passage to the left. Here you'll find a door the opens onto the balcony of the unlocked lecture hall of the First Floor. Here you'll be jumped by a Slime Scholar straight away. These are a little more potent then their lower-level brethren. You'll find another one at the other side of this balcony. On this side, you can also find a door and a lore note at the very end. Exit through this door into an empty room, which you should also exit back into the main hallway. You can pick up two more lore notes in the room on your left. Out on the main hallways, there will be many Scholars to overcome to get to all parts of this section. 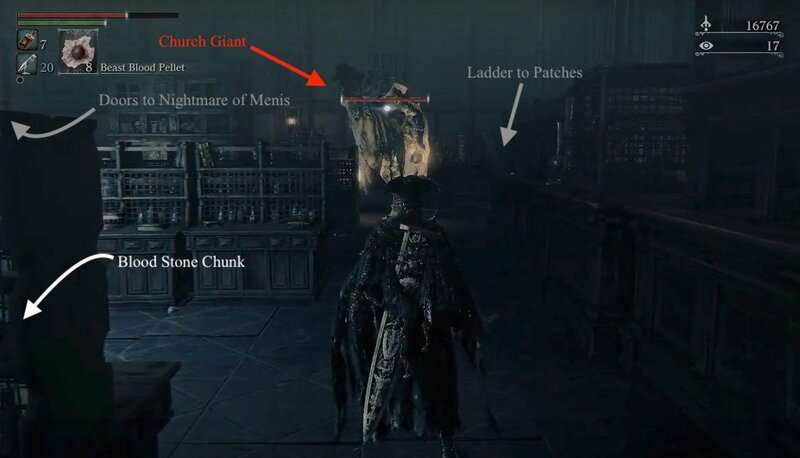 Head across the hall to find a Church Giant in the far corner, but ignore him for now and instead open a door on the wall immediately to your right as you approach the area. You'll find yourself on another balcony overlooking a lecture room. Head all the way around and through the doors on the opposite side. In this room is a chest containing a Communion rune. On the outside of this room, take care of those ranged attackers from up close. Behind them on the floor is a Bloodstone Chunk. Backtrack to the open area with the Church Giant and head over to pick a fight with him. He has some sort of fire buff on his fists, hits hards, and can shatter the wooden tables in the area. Dodge his attacks and get behind him to attack. If you're having trouble with him you can simply lure him out far enough away that you can run to the ladder behind him. You can go down the ladder he was guarding to find yourself on the first floor of the lecture building with your old buddy, Patches The Spider who will teach you the gesture 'Beg for Life' when talked to. In his conversation dialogue choose either option and then speak to him again to get the Anti-Clockwise Metamorphosis rune. Speak to him until you've exhausted the dialogue. Feel free to kill him after he's given you everything he can, to obtain the Great One's Wisdom. Head back up the ladder when you're done with him and open the big doors on your right to enter Nightmare of Mensis. I have a big for me where this location is impossible to access. The NPC at the door keeps telling me to take the plunge even though I have and have already killed Amygdala. Apparently the room is unlocked instantly when you take the plunge, for me it hasn&apos;t and won&apos;t.
You gain insight by talking with Patches and then again for opening the door to the left of him. Where is this place located in the lore? Another dimension? Imagination?